These 3 maps show how a Democratic ‘blue wave’ washed over N.J.
Where did the Democratic veterans who helped flip the House come from? Parsippany, NJ— Speaking in front of a packed house of more than 2,000 supporters, Navy veteran, federal prosecutor, mother of four, and first time candidate Mikie Sherrill tonight claimed a decisive, historic victory in the race for Congress in New Jersey’s 11th Congressional District. Assemblyman Jay Webber called Congresswoman-elect Sherrill this evening to concede. Sherrill’s win marks the first time in more than 30 years that a Democrat will represent the 11th District in Congress, and she will now be the second woman in the New Jersey Congressional Delegation. The victory was the culmination of a bipartisan, grassroots movement built over two years in the 11th, driven by voters’ concerns over health care protections, tax changes that leave New Jersey homeowners behind, and gun laws that have left too many firearms in dangerous hands. “Tonight, we celebrate a historic moment, born of our deep belief in what we have to do to make America what it can be and should be,” said Congresswoman-elect Sherrill. “I swore my first oath to support our country when I was 18 years old, and ever since that day, my confidence in our democracy has never wavered. Out of the cynicism, the distrust, and the attacks on our democratic ideals, we have found what exists inside all of us: the simple truth that we love our country, that we are no longer taking our government of the people, by the people, and for the people for granted. In fact, we are going to do everything in our power to protect it. “Tomorrow, our work really begins: for health care that doesn’t make you choose between treatment and putting food on the table; for a tax code that makes it possible to raise a family and retire here in New Jersey; for infrastructure that ensures you can work hard and also make it home for dinner; for gun laws that make it safe to go to school, to the movies, and to a church, synagogue, or mosque. Now is the time to face these challenges and rebuild our democracy—to restore the trust in our government and our faith in our country. Now is the time for our country to come together. Mike Sherrill is a Naval Academy graduate, Navy veteran and helicopter pilot, former federal prosecutor, mother of four, first-time candidate, and the Congresswoman-elect for New Jersey’s 11th Congressional District. Could Military Veterans Change More Than Control of Congress? Fairfield, NJ – Over 300,000 residents of New Jersey’s 11th District live with pre-existing conditions. These residents and their families rely on healthcare coverage, guaranteed by the Affordable Care Act. At a time when the Affordable Care Act – specifically coverage for pre-existing conditions – is under constant threat by Congress, it’s more important than ever to elect representatives who will fight to protect the gains in coverage made under the ACA. Meanwhile, Assemblyman Jay Webber has a record that makes it clear that he won’t support the Affordable Care Act and will stand with the administration on rolling back guaranteed coverage for pre-existing conditions. Scott Morgan of Denville, New Jersey, is the father of a 2-year-old daughter who was born with a number of heart, lung, and lymphatic issues which require ongoing care from a variety of specialists. He and his wife Elena rely on protections within the Affordable Care Act which congressional leaders have repeatedly attempted to repeal. In Congress, Mikie Sherrill will work to improve our healthcare system so every American has quality and affordable healthcare. She is committed to strengthening the ACA, protecting coverage for pre-existing conditions, while finding ways to expand care. Fairfield, NJ—William Schievella, a law enforcement professional with over two decades of experience in Northern New Jersey, announced his endorsement of U.S. Navy veteran and former Assistant U.S. Attorney Mikie Sherrill for New Jersey’s 11th Congressional District. Schievella served as the Undersheriff and Chief Warrant Officer at the Morris County Sheriff’s Office from 2015 to 2017. Prior to that, he was the Chief of Detectives in the Morris County Prosecutor’s Office from 2007 to 2013. He is currently the Director of Communications & Community Policing in the Bergen County Sheriff’s Office, and the Director of the Police Studies Institute at the College of Saint Elizabeth in Morristown. Fairfield, NJ—In a year in which women across the political spectrum are engaging in the midterm elections at record levels, the 11th District of New Jersey deserves a Representative who will fight to protect and further women’s rights and issues important to women. It is plain to see that Mikie Sherrill is that candidate, and Assemblyman Jay Webber is not. Assemblyman Webber has shown both disregard and disrespect for the rights of women throughout his time in the State Assembly. His record proves that he will not advocate for women if elected to Congress. This is a stark contrast to Mikie Sherrill, who supports equal pay for equal work, will protect a woman’s right to choose, will fight to strengthen the background check system and keep guns out of the hands of domestic abusers, and will support working families by supporting paid family leave. Fairfield, NJ—In New Jersey’s 11th District, the congressional tax bill hurts the pocketbooks of our residents and threatens the future of Social Security and Medicare. The average NJ-11 homeowner pays more than $19,000 a year in state and local taxes, nearly double the $10,000 cap recently made permanent by Congress. It’s clear that this cap is a burden, which is why every Congressman from North Jersey voted against the tax plan. And now, congressional leadership has doubled down on using the $1.9 trillion they added to the deficit with the tax bill to justify cuts to Social Security and Medicare. In spite of these facts, Assemblyman Jay Webber supports the tax plan every chance he gets. Mikie Sherrill is running for Congress to bring new leadership to Washington. She will work to restore the full state and local tax deduction, fight for a better plan for the middle class, and bring New Jersey dollars back to our state. Mikie Sherrill will oppose any budget that would cut or privatize Social Security and Medicare in order to pay for this irresponsible tax bill. The cap on the state and local tax deduction funds the tax bill and Webber is trying to have it both ways. Congressional leadership continues to target Social Security and Medicare now that they have ballooned the deficit, up 17% this year alone. 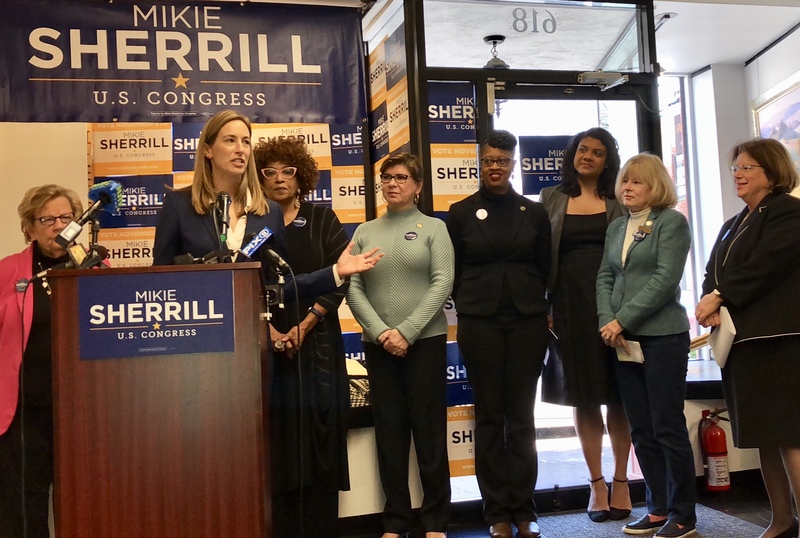 Fairfield, NJ—Today Mikie Sherrill picked up two more high-profile endorsements ahead of the general election next week. The Honorable Barbara A. Curran (R), the first woman to serve in all three branches of New Jersey government, and Susan Hoag, former Chatham Township Mayor and Councilperson, announced their support for Sherrill. The Honorable Barbara A. Curran is a former New Jersey Superior Court Judge who works pro bono with government and community organizations to provide legal, educational, health, housing and employment services to veterans and their families. Judge Curran was elected to four terms in the New Jersey legislature and served as a member of the cabinet for two New Jersey Governors. Susan R. Hoag served on the Chatham Township Committee for six years as a Republican. She served as Chatham Township Mayor in 2001 and 2004, and Deputy Mayor in 2000 and 2003. Hoag is a resident of Chatham Township. Fairfield, NJ—With one week before the election, voters around the 11th Congressional District are taking time to reflect on this election cycle and all that they have heard from the candidates. When taking stock, it’s clear to voters that Mikie Sherrill has been, from the beginning, the only candidate running a positive campaign focused on making life better for the residents of New Jersey’s 11th Congressional District. Mikie Sherrill is running for Congress in New Jersey’s 11th Congressional District. She is a U.S. Navy veteran, former federal prosecutor, and mother of four who is focused on bringing new leadership to Congress. Sherrill launched her bid for Congress in May 2017, quickly gaining support from communities across the district. She won the Morris and Sussex county nominating conventions by overwhelming margins, and by the first quarter of 2018 raised $2.3 million dollars. Sherrill won the June Democratic primary with more than 77 percent of the vote. Sherrill’s endorsements include The New York Times, The Star-Ledger, The Bergen Record, The Daily Record, New Jersey Hills, Vice President Joe Biden, Congressman Donald Payne Jr., VoteVets, Serve America, EMILY’s List, Giffords, Moms Demand Action Gun Sense Candidate Distinction, Everytown for Gun Safety, Brady Campaign to End Gun Violence, Planned Parenthood Action Fund, NARAL, Human Rights Campaign, Garden State Equality, Sierra Club, New Jersey Firefighters’ Mutual Benevolent Association, New Jersey Policemen’s Benevolent Association, LIUNA, International Union of Bricklayers & Allied Craftworkers, New Jersey State Association of Pipe Trades, SEIU New Jersey State Council, 1199 SEIU, 32BJ SEIU, International Union of Operating Engineers Local 825, Essex County Building Trades, and the JNESO Healthcare Union. Fairfield, NJ—Today, Mikie Sherrill was joined by Emily Cain, Executive Director of EMILY’s List, women candidates running for local office within the 11th District of New Jersey, and over 150 residents to get out the vote for 11 days ahead of the November 6th election. Mikie Sherrill is running for Congress in New Jersey’s 11th Congressional District. As a U.S. Navy veteran, former prosecutor, and mother of four, Mikie Sherrill is focused on bringing new leadership to Congress. She will work with Republicans and Democrats to restore the full state and local tax deduction for New Jersey taxpayers, work to fix the Affordable Care Act to bring down health care costs, and focus on creating good paying jobs in New Jersey. Fairfield, NJ—Local One of the International Alliance of Theatrical Stage Employees announced their endorsement of U.S. Navy veteran and former Assistant U.S. Attorney Mikie Sherrill for New Jersey’s 11th Congressional District. Local One represents hundreds of Stagehands and Entertainment Technicians who reside in NJ-11, and provide services throughout the entertainment industry in Manhattan, Staten Island, the Bronx, Westchester, Putnam, Nassau and Suffolk Counties in New York. Local One of the International Alliance of Theatrical Stage Employees is the oldest entertainment Union in the United States, representing working men and women who install, operate, and create production for live theater, live television, audio and scenic shops, special effects, industrials, corporate events and concerts as the largest stagecraft Local in the world. Fairfield, NJ—Today the National Association of Realtors PAC endorsed Mikie Sherrill for Congress in New Jersey’s 11th District. The National Association of Realtors PAC endorses candidates on both sides of the aisle who are dedicated to supporting American homeowners. New Jersey homeownership has still not recovered from the Great Recession. Since 2008, home ownership in New Jersey has fallen 2.5 percent. The congressional tax hike bill hurts property owners with its $10,000 cap on the state and local tax deduction, and was recently made permanent by Congress. Montclair, NJ—As a career politician in Trenton, Assemblyman Jay Webber has a ten-year history of voting against the women and families of New Jersey. 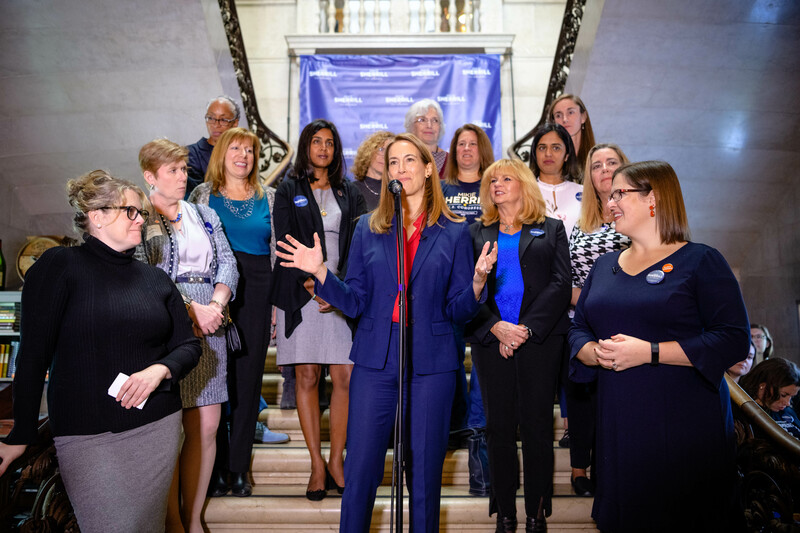 Today Mikie Sherrill, Democratic candidate New Jersey’s 11th Congressional District, joined with women of the State Senate and State Assembly joined today to highlight Assemblyman Jay Webber’s harmful voting record on women’s issues.